The Burien Film Festival (BFF) is offering sponsorship opportunities for its upcoming 2017 season! Choose your level of sponsorship and receive exclusive opportunities for exposure to a dynamic audience through a unique mixture of access, exposure, placement and recognition at this year’s event. BFF was born out of a love for film arts, and an awareness that we need to bring positive attention to Burien. The Burien-centric Short Film Contest highlights Burien neighborhoods and businesses, and supports, through cash prizes, Burien’s top filmmakers. Burien is home to so many gems and sometimes the best parts of Burien don’t get enough media attention. We want people to come to Burien, bringing their dollars and sense, to experience what makes Burien awesome (to borrow Discover Burien’s mantra). Open Short Film Contest – we have attracted over 700 international filmmakers!! BFF was founded in 2015 by Shelli Park and John White after making the circuit of film festivals in support of ‘The Maury Island Incident.’ Both Park and White support the arts and economic development in Burien and, with their festival experiences, decided Burien needed a film festival. Burien Film Festival brings regional, national, and international attention to Burien through the addition of two contests, Student and Open. 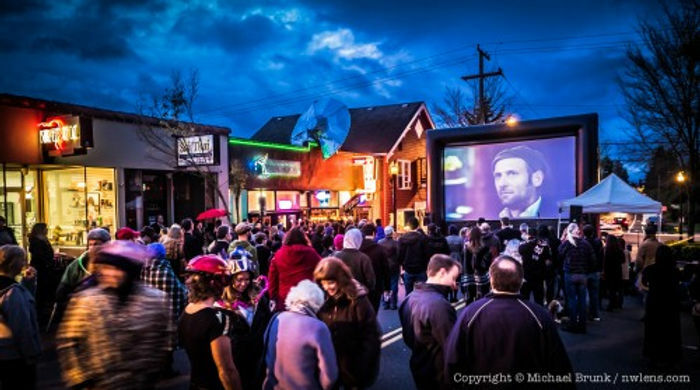 We have had an outpouring of international entries for the Open Film Contest, so we are adding a Film Crawl in Olde Burien on June 24th to expand the opportunities to view the world through short film. Statistics: In 2016, BFF attracted 2400 people, a 600% increase in audience from 2015. The audience comes from around the region. We project attendance to be close to 3000 with this year’s enhanced marketing plan involving multi-tiered community outreach in the Greater Seattle Area and bringing more entertainment options, spreading the event over four days. As a Burien Community Partner you will benefit by having small Logo Placement on BFF on Event Handbills and Collateral Program Material; Logo Placement on Sponsor Page of BFF website; Designated Space at Event for Specific Company Promotions; Distribution of Products or Promotional Pieces to Event Attendees in Swag Bag; BFF Supporter sticker. As a Hollywood Agent, two company representatives will have access to the VIP seating at your chosen area (stage or screen); small Logo Placement on BFF on Event Handbills and Collateral Program Material; Logo Placement on Sponsor Page of BFF website; Logo Placement on Pre-Screening Trailer shown at The Tin Theater and Columbia City Theater (at least 20 film showings); Designated Space at Event for Specific Company Promotions; Distribution of Products or Promotional Pieces to Event Attendees in Swag Bag; Written recognition on Event Brochure and Website; Opportunity to place a 1⁄8 page black and white advertisement in BFF brochure which will be distributed to event attendees; BFF Supporter sticker. Silver Screen Star Sponsor: $750.00 As a Silver Screen Star, four company representatives will have access to the VIP seating at your chosen area (stage or screen); medium Logo Placement on BFF on Event Handbills and Collateral Program Material; Logo Placement on Sponsor Page of BFF website; Logo Placement on Pre-Screening Trailer shown at The Tin Theater (at least 20 film showings); Designated Space at Event for Specific Company Promotions; Distribution of Products or Promotional Pieces to Event Attendees in Swag Bag; Written recognition on Event Brochure and Website; Opportunity to place a 1⁄4 page black and white advertisement in BFF brochure which will be distributed to event attendees, BFF Supporter sticker. BFF Park Outdoor Theater Sponsor – June 22: $2000.00 As BFF Park Outdoor Theater Sponsor, your company’s name will grace the screen on a 15 ft. banner (The (Company Name) Stage); Six Company Representatives will have access to VIP seating at the screening area, ; plus the benefits listed in Hollywood Agent level, BFF Supporter plaque. BFF Main Outdoor Theater Sponsor – June 24: $2500.00 As BFF Outdoor Theater Sponsor, your company’s name will grace the screen on a 15 ft. banner (The (Company Name) Stage); Six Company Representatives plus one guest each will have access to VIP seating at the screening area, and at the 909 beer garden near the screening area (six drinks and appetizer on us! ); plus the benefits listed in Hollywood Agent level, BFF Supporter plaque. BUFO Presenting Sponsor: $5000.00 As a presenting sponsor, your company name will accompany BUFO (Burien UFO Festival presented by Company Name ) on all media material and on both 20ft. banners; Six Company Representatives will have access to VIP seating at the stage and screening area, and at the Tin Room beer garden (six drinks and appetizer on us! ); plus the benefits listed in Hollywood Agent level; BFF Supporter plaque. 9:30PM: Watch the Best of the Best BFF Films on the 26′ Outdoor Screen. Your participation in making this community event bigger and better is deeply appreciated. You make it possible to continue to strengthen Burien’s positive visibility in the region, build community and support the arts.